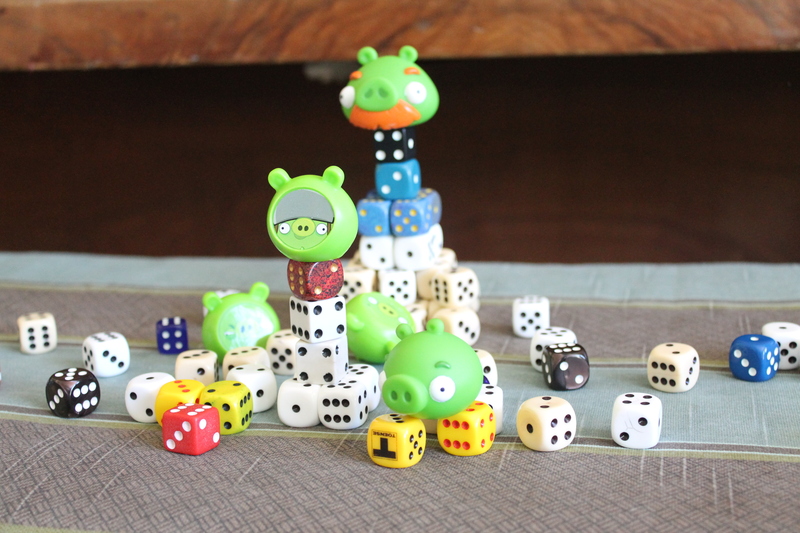 Following up on yesterday’s Daily Dose of Dice, it should also be noted that dice make excellent rubble. It’s not quite as photogenic as something like Hashima Island or Chernobyl/Pripyat‘s rubble, or the hauntingly beautiful short film RUIN, but it’s good reference for porcine construction crews everywhere. 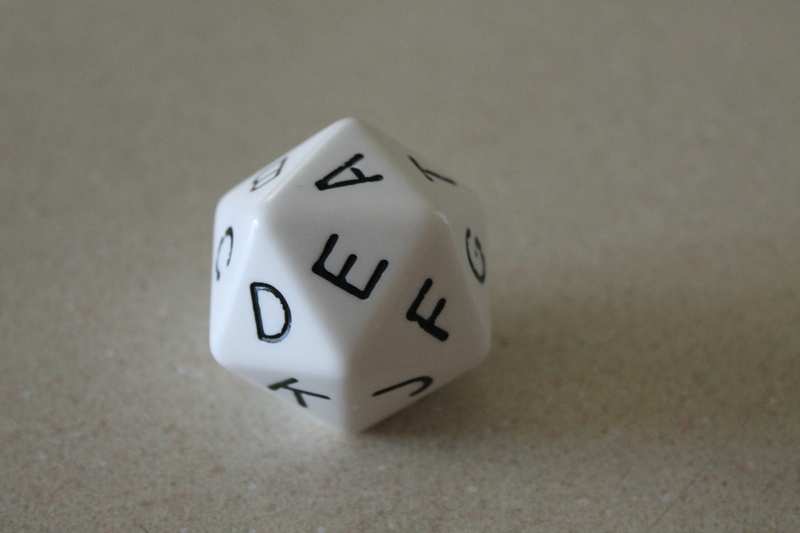 Dice can be useful to randomize letters, say, when you’re making a cipher, or trying to write fantasy or science fiction proper names. Ojmwrgm, the pirate, for example. ‘Tis the time of year that many people gather in groups of family and friends to celebrate assorted things. I’m of the American and Christian persuasions, so it’s Thanksgiving and Christmas for me and mine, but there’s no apparent shortage of celebrations for diverse tastes. Maybe being cooped up together out of the snow means we either party or kill each other. I do prefer the former, though the latter might be easier sometimes, especially when awkward situations arise. I’ve noted, with no small amount of whimsy, that I could map certain classes or roles we might see in World of Warcraft to people I see in these gatherings. They don’t map perfectly, since socialization is PvP (Player vs. Player) rather than PvE (Player vs. Environment), and threat doesn’t work the same way, but there are some interesting parallels nevertheless. This guy wants all the attention, and will make efforts to control the direction of conversation and protect weaker conversationalists from the ire of dissent. There are, of course, different different tanking styles, but all have a variety of tools to deflect tangents and monopolize crucial conversational pauses. A bombastic or otherwise “large” personality or presence greatly benefits the social tank, even if it is ultimately of little substance. Maintaining the focus of attention is key, not presenting a cogent argument. These are the guys who actually move a conversation along. The Tank has to spend so much effort keeping a conversation on topic and heading off tangents that he has to rely on the DPS conversationalists to move the chosen topic along. They will usually do this with supporting anecdotes or witticisms. Some are blunt force conversationalists, seeking to make progress by sheer magnitude of presentation, while others are precision specialists, doing the most with a few carefully timed words in the right place. Occasionally DPS teams will form and act in concert to magnify their efforts. They must be careful not to steer the conversation, though, since they don’t have all the necessary tools to direct the conversation away from tangents and deflect dissent, and may occasionally be leveled by a precise counterpoint. Some DPS conversationalists might specialize in Crowd Control, a nearly lost art of taking down tangential threats on the periphery of a conversation. Since this is a job best done without drawing much attention, it is often unsung, but no less important, especially in large gatherings. These are the peacemakers. When tensions get high, these conversationalists seek to defuse the situation with placation, humor, distraction or food. This tends to require a soft touch, lest the tank lose control of the underlying conversational direction. The Healer doesn’t so much seek to change the conversation’s direction, but rather, to manage its tone, keeping things moderate and keeping contentions down and therefore make the Tank’s job easier to manage. This tends to be easier when they have food to offer, so careful pacing of meal courses and foresight in management of non-conversation resources will benefit the healer. Desserts are a powerful wildcard in the healer’s arsenal, and many healers will come prepared with a wide assortment. A social generalist, the Druid can Tank, DPS or Heal as necessary, though they must specialize in one to be as effective as a specialist. They smoothly shift between roles as a conversation unfolds, filling in gaps left by inattention or mistakes. They might tank at close quarters and then shift to backstabbing at a moment’s notice, or they might lob comments from afar, or even bring some snacks to the table. Since none of their tools are very strong, though, they must try to anticipate the social scene’s intricacies correctly and use precise timing as leverage to maximize their efforts. More than most, Druids need to understand the ebb and flow of the nature of social situations and all the varied aspects so they can shift their own position. These guys are well known for their ability to kill a conversation and then revive it under their control. Well equipped to deflect criticism with thick disregard for insult and having very strong presence, they work well as Tanks, or they can fill the DPS role well by making heavy handed points as they make others uncomfortable with implications. Likely to be depressed and depressing, and possibly harboring conversational grudges from past parties. Careful conversationalists, Hunters function in a pure DPS role. Some prefer to snipe from the periphery, offering precision arguments. Others bring a companion for distraction while they chime in with timely comments. Yet others lay careful conversational traps and quietly guide others into making mistakes. Hunters are often used by Tanks to initiate a conversation with offhand comments, which they then follow up on with their unique talents. Another pure DPS class, Mages have a few distinct styles. Some prefer fiery rhetoric with lingering implications. Some prefer the cold shoulder technique (sometimes called “wet blanket”), heavy on control tactics that help the Tank. Some prefer broad spectrum wild generalizations and arcane statements about irrelevant factoids, reveling in confusing the foe. Mages love to flaunt their intelligence in one way or another, often trying to outsmart opponents for the sheer joy in doing so. A Paladin is a hybrid like the Druid, capable of filling any of the significant roles. They can’t shift between roles as fluidly as Druids, but they are better equipped at all times to deflect dissent. Their reduced flexibility is balanced by their defense. They tend to specialize in one of the roles, but all will have a sanctimonious air that is offputting to foes and encouraging to friends. They tend to direct conversations to The Truth when possible, and have particular and peculiar talents that keep dead conversations down. The quintessential Healer, Priests share the sanctimony of paladins, but wield it much more effectively. They might play the pariah or simply call for repentance, or they might simply offer a constant stream of calming platitudes with little substance to argue about. Some will simply keep bringing food to the table. A few will step into a DPS role with biting chastisement or darkly portentious comments. Rogues serve only their own interests, but understand that hiding behind a Tank (or better, hiding behind their opponent) is a safer place to be. They are pure DPS conversationalists, seeking primarily to make a point, and if possible, to make it hurt. They converse from the shadows, sometimes seeking to slowly erode an opposing viewpoint, sometimes acting swiftly and mercilessly to cut down a line of thought. They are remarkably direct, and everything is personal with a Rogue. They may serve a team goal at times, if circumstances align, but are unmistakably their own person with their own goals. Adept at sensing the nature of conversation, Shaman tap into social undercurrents to work their magic. Some will Tank in lighter encounters, but most will either fill a DPS or Healer role. Uniquely equipped with trinkets and tools with which to make conversational points via object lessons, they tend to be masters of minutiae and trivia. This can serve to further a conversation or manage its tone. Shaman are hybrids, adept at filling holes in a team, though they aren’t as agile as Druids. Shaman tend to be relatively immobile, but versatile. They are excellent team players, with a wide array of support tactics. Pure DPS in every form, a Warlock can’t help but be caustic, and is inordinately fond of veiled insults that result either in lingering shame or self-doubt. May or may not have companion in tow, appropriately attired for maximum distraction, whether employing fear or more… amorous (though cruel) intentions. Master of snide asides, arch allusions and faux British accents. Blessed with an uncomplicated approach to life, Warriors tend to either master a Tank role or a DPS role. Heavily defended from conversational dissent with a heady mixture of ignorance (pretended or not) and thick disregard for insult, Warriors often serve as rallying points for friends. In the occasion that they step out of the center of attention, they either rely on fast, furious assaults or heavy precision strikes to further a conversation. They can wield nearly any conversational tactic, but work best in direct confrontation. It’s no great surprise to me to find that I can most comfortably identify myself with the Social Druid, though I have pretty solid Hunter tendencies, too. (Never mind that I wrote this, I tried to make them at least somewhat fair.) I’m especially fond of my brother-in-law who is a fantastic Social Warrior. Maybe it’s because he’s a military guy? He plays the Tank and DPS roles very well, leaving me to do my own thing. 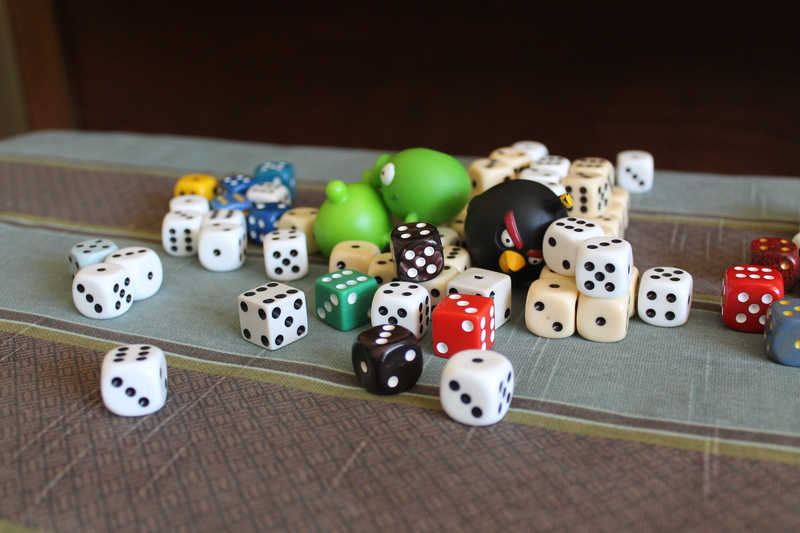 Whatever your game of choice and celebration of choice, though, Happy Holidays and good luck socializing! Oh, and don’t stand in the fire. It really hurts in the real world. The cooks might not be very happy with you either. OK, so it’s a weak pun, but I figured it would go over better than something with SPAM in it. As might seem apparent, this is more game-related links, complete with tangential rumination, with a smattering of other things (as usual). These things tend to be compiled over a week or more, so it’s not going to read as cohesively as a dedicated article. I’ve largely said what I wanted to say about the MMO genre and design, so this sort of tangential discussion will be more common as time goes on. Repeating myself about MMOs gets old after a while. And you just can’t talk to some people. OK, I’m still not really a fan of zombies, previous discussions notwithstanding. That said, I’ve been prowling the archives of a webcomic that a coworker does in his spare time, and this one made me laugh.